Lighting A Revolution: Ink Blotter 214, "A Century's Progress"
Blotter number 214; image number: LAR_B214. 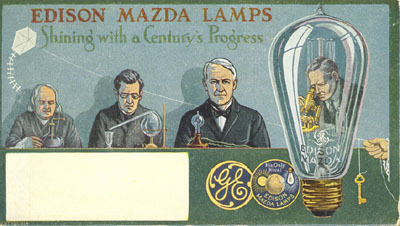 "Edison Mazda Lamps. 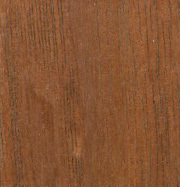 Shining with a Century's Progress." This blotter from the mid-1920s shows the continued reduction in size of the Sun's Rival logo. The familiar General Electric script logo became equal in size to the older trademark. Light bulbs had become familiar devices by this time and the original comparison to the Sun lost appeal for a new generation of consumers. The sales-pitch changed focus from light to the research that lay behind improvements to the lamp. GE shifted the target of the advertising from defeated competitors such as gas lighting companies to active competitorsindependent lamp makers. GE could point to its strong innovative tradition. Here Edison is flanked by two laboratory scientists and linked to Benjamin Franklin. The figure reflected in the light bulb may be Irving Langmuir, who received a Nobel Prize for work done in the GE Laboratory. The identity of the other figure is less certain. Such a lineup conveyed a powerful message to a generation committed to the idea of social progress through technical advancement. And that message of "Progress" is explicit in the text of the blotter. Notice also the portrayal of Edison as an older man rather than the young inventor seen earlier. His carbon lamp no longer represented the forefront of modern technology and he himself had moved on to other inventions. Edison's status as an American icon carried weight, however, and GE made this pitch using his name and his fame. For more about Edison's later life and work see the Smithsonian online exhibition Edison After Forty.